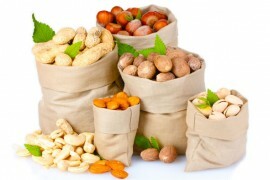 Nuts are 2.5-3 times richer in mineral substances than fruit – i.e. potassium, calcium, magnesium, phosphorus, iron, etc. ; they are rich in protein (16-25%). All varieties of nuts fully preserve their vitamins and nutritional properties not only within one season but much longer. Peeled peanuts, the kernels of which are treated with a jet of hot air. Fine sugarless granulated coconut flakes. They are used for coating muffins, cakes, cookies, etc. Hazelnut paste is 100 % made of hazelnuts. Peanut paste (also known as Peanut butter) is a paste made of fried peanuts. Medium size sugarless granulated flakes with high oil content. They are used as filling for various confectionery products, for coating cakes, pies. There are 639 kсal in 100 g of hazelnuts, as well as a high percentage of protein - from 16 to 19%.